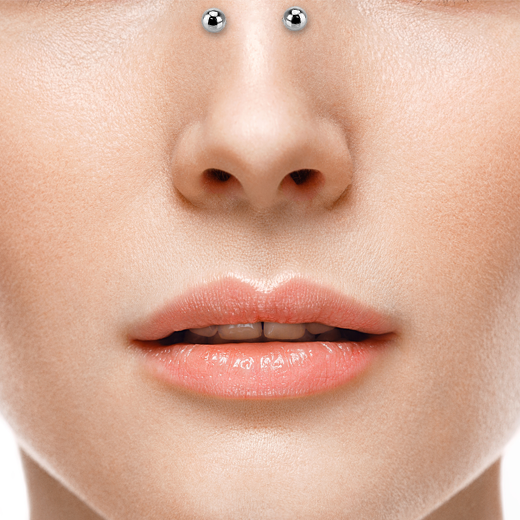 The bridge piercing is one of the newest trends in body modification. An up-and-comer in the industry, it is fast becoming a popular alternative to septum piercings in the body-art community. If you’re looking for a completely new and unique look, the bridge piercing is definitely the right option for you. Less risky than a septum piercing and flashier than a nostril piercing, the bridge piercing will soon be one of the biggest looks around. On this page we go into everything there is to know about the bridge piercing. You can also read some more about nose piercings first. What is a Bridge Piercing? A bridge piercing is a facial or nose piercing that pierces the thin bit of skin on the bridge of the nose, just between your eyes. The vertical bridge piercing is another variant of this and also a surface piercing. The most common jewellery type for this look is the straight barbell piercing, but people sometimes use exciting alternatives such as the curved barbell. How much does a Bridge Piercing cost? Generally this is just the cost of the procedure and doesn’t include the jewellery, but some piercers may throw that in for free. You should do as much research into studios as you can, and not simply go for the cheapest option, as you may regret it if it is not good quality. Shop prices will vary depending on location and popularity of the artist. What is the healing time for a Bridge Piercing? The bridge piercing is relatively straightforward when it comes to healing, but just to be safe, you should not consider removing your piercing for at least 12 weeks. However, it should be healed up sooner than this if you are desperate to change your jewellery after 8-10 weeks. These are just guidelines, you should know yourself how you feel and allow as long as possible to heal fully. How much does getting a Bridge Piercing hurt? The bridge piercing, despite its precarious location, does not actually register very high on the pain scale. Most people find the worst part to be the clamps before the piercing even goes in, and a little discomfort from the swelling between your eyes afterward. If you do swell up easily, then it might seem like you’ve been punched between the eyes and are suffering from the aftermath, but it’s nothing some ibuprofen can’t deal with. In fact, most people believe the swelling to be the annoying bit, with the pain not really being a big deal. If you’re worried about the pain, don’t be, and think about how awesome your bridge piercing will look. Will a Bridge Piercing go through bone? It may look like it, but a bridge piercing doesn’t actually go through bone at all. The bridge piercing actually goes through the skin on the bridge of the nose, which is rather thin, making it a relatively pain-free piercing. The only downside to this thin membrane is that there is a higher risk of rejection. The barbell is the best choice when it comes to piercing jewellery for a bridge piercing, as it’s dual-beaded design allows it to be perfectly balanced on the bridge of your nose. A straight barbell is the most popular choice, but can cause some irritation as the bone of the nose is curved downward in nature. This can make the pierced skin feel a bit tight. A curved barbell is another option as the design allows it to rest perfectly balanced on the nose with stretching the skin too much. Always talk with your piercer before requesting it to be done with a curved barbell. 1. Horizontally - This is the traditional way of wearing a bridge piercing as the beads of the barbell are in line with your eyes, giving it an awesome, reflected look. 2. Vertically - This is the opposite, as the curved barbell runs down the bridge of your nose, showing one bead lower on your nose, and the other between your eyes. 3. Beside Eyebrow Piercings - If you have eyebrow piercings, a horizontal bridge piercing can fall perfectly in line with them. 4. Ball Closure Ring - Once fully healed, a BCR piercing would be an awesome look for your bridge piercing. Just be careful not to catch it on anything. 5. Forehead Piercing - Rather than simply having a vertical piercing, you can have the lower bead between your eyes, and the upper on your forehead. Bridge piercings are not totally risk free, but they are certainly less risky than most piercings. Here are some of the risks involved. There is a small chance of infection with any piercing. With a bridge piercing, general aftercare and cleaning should prevent any serious problems. Just be sure not to get the aftercare products in your eyes. The main issue people have with bridge piercings is the swelling between their eyes afterwards. You might feel like you’ve been punched. Don’t worry, this will go away in time. For the time being, any anti-inflammatory painkillers will keep the swelling down. Some facial creams and products, especially those containing alcohol can cause some irritation in the piercing which is not pleasant at all. Try to avoid touching your bridge piercing if you can. If you don’t get a quality piercer, you won’t get a quality piercing, and they may end up damaging your septum. Be sure to do your research beforehand. 1. Make sure to only use antibacterial soap, nothing with perfumes, and wash the bridge of your nose gently and your hands. 2. Use one of our handy salt spray solutions which can be sprayed directly onto the piercing, or dabbed. Be careful not to spray yourself in the eyes, but if you do, it’s just salt and water anyway. 3. Use a thick tissue to gently dab the solution into the bridge of your nose where the piercing is. 4. Give the piercing the gentlest of twists just to make sure the solution is soaking all the way through. 5. Don’t wash your bridge piercing more than twice a day, and avoid any thick creams or alcohol solutions in the first 2 weeks as they may cause irritation. 6. You need to keep cleaning your bridge piercing, because the last place you want to get an infection is between your eyes.